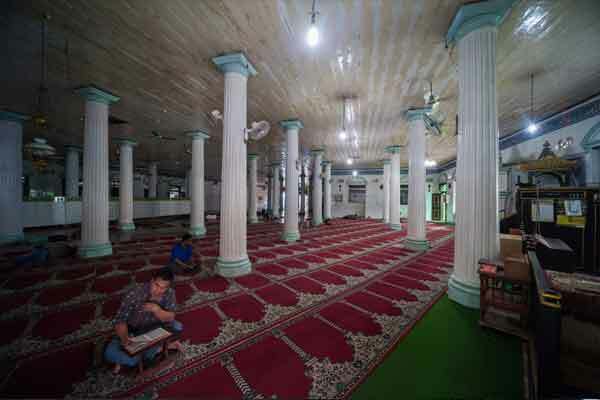 There are two mosques in Old Batavia that were built in the 18th and 19th century. These are the An-Nawier mosque and the Masjid Langgar Tinggi at Pekojan, now more familiarly known as Kampung Arab or the Arab village, in West Jakarta. Before the Arabs, the neighborhood was dominated by Muslim Indians from Bengal. The name Pekojan is said to derive from the word “Khoja” or “Kaja”, an area in India. On the other hand, the word “khoja” is also the name of the headdress worn by men from the neighbouring province of Banten. So Banten soldiers who fought with Prince Fatahillah, founder of Jakarta, could well have stayed in this area. And indeed, as Jakarta and later Batavia was a busy international trading port, the town was always full of traders from different ethnic groups who formed their own communities and settled together in villages called “kampungs”. The An-Nawier mosque - also known as the Pekojan Mosque, in the Pekojan subdistrict, - was built in 1749 AD, (or 1180 H according to the Islamic calendar), by Syarifa Fatimah binti Husen Al Idrus. This is the largest and oldest mosque in Old Jakarta and has a number of unique elements. It has an L-shaped floorplan for congregational prayers with capacity for 2,000 persons. The roof is supported by 33 pillars, symbolizing the 33 holy verses that are to be cited after prayers. Outside the mosque stands a 17 meters minaret which closely resembles a light house. According to stories related by the locals, in the past, whenever there were uprisings against colonial powers, Indonesian freedom fighters would find shelter in this narrow tower, safe from their pursuers. Walking from this mosque to Masjid Langgar Tinggi, one passes a bridge called Jembatan Kambing – or the Goats’ Bridge over the Angke river. This bridge used to lead to the slaughterhouse for the poor goats. But the slaughterhouse is now no more, although many of those of Arab descent who still live here continue to raise and trade in goats, as they have done for over 200 years. Arriving at Masjid Langgar Tinggi, or the Tall Mosque, one understands instantly why this mosque is so called, since it consists of two storeys, something quite unusual in those early days. Masjid Langgar Tinggi, which is located along the Angke river, is said to have been built in the year 1829 AD (or in 1249 H according to the Islamic calendar year). Its upper floor, where prayers are held, is made of wood, and is still original and remains in good condition until today. The ground floor houses the person guarding the mosque. Its architecture is a fusion of moorish and colonial with Chinese and Javanese elements. Its pillars are in classic European design, the supports of its pillars are Chinese, and their base is Javanese. Its pulpit comes from Palembang, South Sumatra.